Does the Lift come with a monitor mount? Although a monitor arm is available to you as a separate option, it is not built into the Lift Standing Desk Converter. If you choose to add a Monitor Arm, pick one with a clamp mount so all you will need to do is clamp it in place to elevate your monitors. Almost! When you unbox your Lift all you will need to do is attach the keyboard tray and tighten two bolts. Then set on almost any flat surface, table, or desk to enjoy more height adjustability. How do I know this will this fit on my desk? You will need to have a space that is at least 36" wide by 24" deep for the Lift Standing Desk Converter. Also keep in mind that the keyboard tray will stick out a little further than the base, so you'll need to account for that as well. Does the keyboard tray slide in and out? No, the keyboard tray does not offer any adjustment. It will move at a fixed position along with the converter. 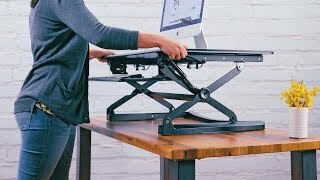 The Lift Standing Desk Converter weighs 52 pounds. Can I remove the keyboard tray from this converter? Yes! The keyboard tray hooks onto the Lift Standing Desk Converter and can be easily removed if you do not want it. Can I put three monitors on the Lift? The Lift Standing Desk Converter can support up to 33 pounds of weight. However, we really only recommend installing two monitors as the converter's stability can be affected by too much weight if it's not balanced properly. Will my wires get pulled when I move from sitting to standing? Please make sure that your wires have adequate slack so that they don't pull when you go from sitting to standing. How easy is it to lift the converter? The pneumatic lift makes height adjustments as easy as squeezing the handles and lifting to your preferred standing heights! Can I position the keyboard tray so that it hangs below my desk? At this time, the keyboard tray on the Lift does not hang below desk level. Have your pick between two sizes of the Lift Standing Desk Converter - small or medium. The small desk converter boasts a work surface that is large enough to hold a single or dual monitor mount. Add in the space provided by the attached keyboard tray, and you have yourself a desktop converter that is compact but still packs a punch. The medium Lift Standing Desk Converter offers more space to spread out your work. This is a great option if your stationary desk provides enough desktop real estate on which to set the desktop converter. Both the small and medium-sized desktop converters are available in black. Black has been the long-held standard color for office furniture because it meshes well with most office decors. To add a refreshing pop of white to your office, consider choosing the medium-sized Lift Standing Desk Converter in white. At this time, the small Lift Standing Desk Converter is not available in white.